In the first entry in this series I discussed my love of all-things analog and went into some detail about a few of my favorite tools and gear. In this installment I’m going deeper into the tools and will give some specific recommendations for what to use when you’re ready to embrace the analog. There’s a lot of ground to cover, so let’s get started. Oh, fair warning: This is gonna get nerdy. First off, you’re gonna need something to write on. You can’t really make important notes, or write your first novel, on a cocktail napkin or your hand. Well, you could. However, it’s probably not a great idea. So, you need a notebook. More than one, really. I use a few different notebooks depending on what I’m doing and/or where I’m going. I always cary a small notebook in a pocket for those times when I need to write something down right now so I don’t forget it. For that, I most often choose one from Field Notes. These notebooks are small enough for a pocket and tough enough to stand up to everyday use. The paper in the Field Notes notebooks isn’t the best, a trade-off for their portability and durability I would guess, and it doesn’t handle fountain pens particularly well. But if you use pencils or gel pens it works great. I love them. For a larger notebook, I used to be devoted fan of the venerable Moleskine. But in the last few years, their quality has declined quite a bit so I don’t use them anymore. 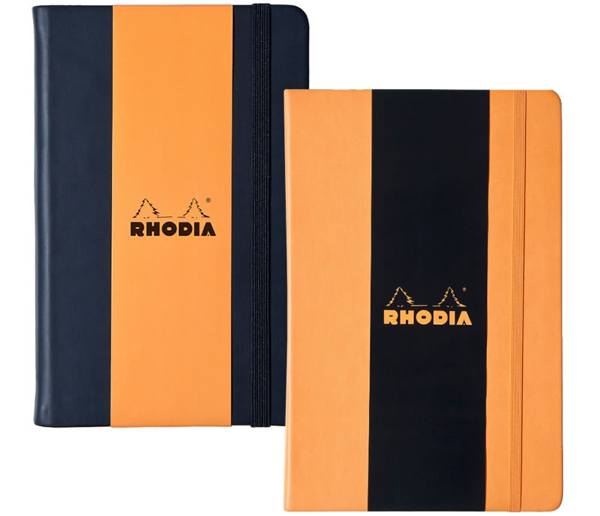 The main larger notebook I use daily is from a company called Rhodia. The Rhodia Webnotebook is a bound notebook with heavy, quality paper I really enjoy writing on. It handles pretty much any type of writing implement with no trouble. Pencils, gel pens, fountain pens, whatever. My only minor issue with the Rhodia (and this could just be me or the pens I’m using it with) is it tends to be a bit scratchy, for lack of a better word, when using some fountain pens. That’s not to say you shouldn’t, or can’t, use a fountain pen with them. You can. I would just prefer a bit less resistance/drag from the paper. This isn’t an issue when using pencils or gel pens, just some fountain pens. And really, it probably isn’t much of an issue at all. You might not even notice. It’s also quite possible I press too hard when writing. I’m going to try some different fountain pens, nib sizes and inks to see if any of those make a difference. But even with that occasional, minor issue, the Rhodia Webnotebooks are terrific. I’m also a fan of products from Doane Paper. They make some great notepads and notebooks. Two in particular I frequently use are the standard large Notepad and the Idea Journal in both large and small. The Notepads are just what you think they are: a notepad. The difference is the paper. It’s way better than something like a traditional yellow legal pad or what you would find at the local Target. The notepads are very good. I keep one on my desk all the time to make notes during phone calls or to write down what we’re going to discuss during the latest episode of The Flickcast. They’re very useful. The Idea Journals are wire-bound notebooks and built like tanks with nice, think, quality paper and a thick cardboard cover and back. They also have a remarkably useful grids + lines pattern that allows you to both write on them and do sketches, drawings or whatever “idea” you may come up with. I mostly use them to write down ideas and sketch concepts for things I’m going to make in the woodshop or other to-do projects I need to tackle around the house. They can also function as regular notebooks if you’re just looking to make a grocery list or something. Plus, the paper is perforated so if you need to pull out a page and give it to someone, you can. Now that we have the notebooks and paper sorted out, we need something to write with. Of course, that means we need a pen or pencil. Or several of both. I often carry several different pens and pencils with me, depending again on what I’m doing and/or where I’m going. Let’s start with pencils. 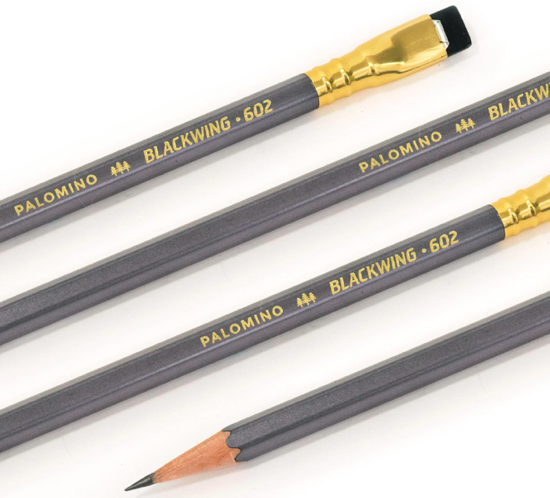 My top choice is the Palomino Blackwing 602 followed by the General’s Cedar Pointe 2. Both of these are terrific to write with and prime examples of a great pencil. Real cedar bodies and premium graphite cores that write smoothly and last a long time before they need sharpening. I can’t recommend them enough. There’s also a few other ones such as the Golden Bear Blue #2 and the Forrest Choice #2. 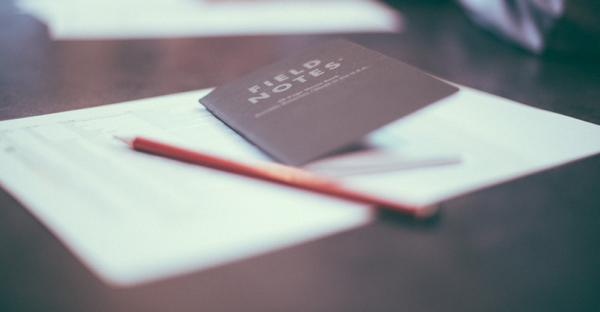 Field Notes also makes a good #2 pencil which is worth checking out. The other ones are quite good and a worthy alternative if you’re just starting out or if price is a factor. However, the General’s Cedar Pointe #2, and the Blackwing 602 in particular, are the best. Give them a try and you’ll see what I mean. Turning to pens, there’s a few different styles/brands I prefer. Fortunately, none of them are the most expensive available. You can definitely spend a lot of money on fountain pens. But from what I’ve found after trying a lot of different ones, you don’t need to to get the pleasure and experience of using an exceptional writing tool. For fountain pens, the two I recommend to start with are the Pilot Metropolitan and/or the Lamy Safari. They are both excellent and won’t break the bank. If you really end up enjoying fountain pens, you can always buy more and spend a lot more money on them. But if you just want a great fountain pen and aren’t ready to throw down a few hundred bucks, either of these will serve you well. I’m also a big fan of gel pens, which are pretty inexpensive and handy to have. I always use one or both of these: the Uni-ball 207 or the Uni-ball Jetstream. Buy a few boxes and keep them around the house, in the car or in your backpack or purse. It’s good to have a pen handy. If you use notebooks, pens and pencils, you’ll likely need something to carry them in. You’ll also need some other support items. For pencils, you’ll need a way to keep them sharp. For home use you can opt for a tabletop sharpener like the Uni KH-20 or the Carl Angel-5. I have and use both and they each do a fantastic job, with the Carl Angel-5 probably being slightly better. When you’re on the road, there’s nothing better than the KUM Masterpiece. 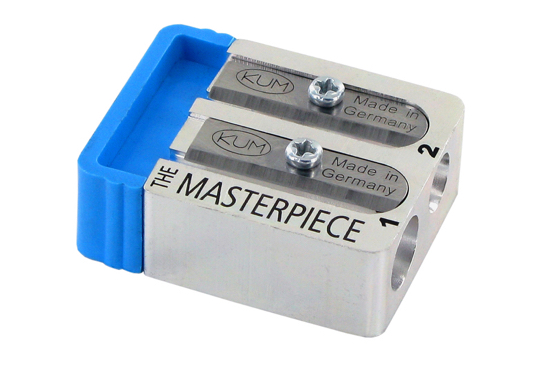 It’s an amazing device with a two stage process that sharpens a pencil to a long, fine point. I always have one in my bag. And, if you use a pencil very often, you’re probably going to need an eraser at some point. The pencils I recommended above come with an eraser attached. However, I tend not to use those unless I have too. They aren’t the most efficient and I like to keep my pencils looking tidy. So for most situations, I use an eraser like the Staedtler Mars Plastic to take care of mistakes . . . not that I make very many. For fountain pens, you’ll need ink. Some pens, such as the two I recommended above, come with an ink cartridge and that’s something you can use. If you want to take it a little further you can add a converter to the pens and use actual fountain pen ink instead. That’s the method I prefer. The Pilot converter can be found here and the Lamy Converter here. And yes, I have a favorite brand of fountain pen ink. I told you this was gonna get nerdy. The ink is called Pilot Iroshizuku and I most often go with Bamboo Charcoal Black (take-sumi) or Deep Azure Blue (kon-peki). But feel free to branch out color-wise. There’s quite a few choices. However, the ink cartridges that come with the pens from better companies like Pilot and Lamy are just fine to get you started and, in fact, would be fine to use on a daily basis. I just prefer nicer inks like the Pilot Iroshizuki. Gel pens have ink when you purchase them and once you use it, it’s gone and you need a new pen. Actually, that’s not entirely true. You can refill some brands of gel pens. People do it, but I don’t. Even I’m not that nerdy. I just grab a new one and go. That’s one of the reasons I prefer fountain pens. You only need to buy them once and over time purchasing ink in a bottle and refilling the pen is more economical than throwing away a gel pen when it runs dry. A fountain pen doesn’t use that much ink so a bottle will last you quite a long time. I’ve had a few bottles for over a year and they’re still not empty. Plus, refilling your fountain pen instead of throwing more plastic in a landfill is better too. Now that you have all of your tools and accessories assembled, you’ll want a way to transport them to wherever you need to go: work, school, the local coffee shop, etc. That means, of course, that you’ll need a bag. As with the other tools I’ve already mentioned, I’ve gone through a lot of bags over the years. A lot. I could never seem to find the right one to accommodate the things I want to carry but also be comfortable and not give me shoulder and back problems from its bulk or weight. Fortunately, my search ended when I discovered a company called Tom Bihn. The bags are terrific and, as a bonus, made in the USA. My two favorite bags from Tom Bihn are the Pilot and the Co-Pilot. If I just need a smaller bag to take an iPad, some pens, pencils and a notebook with me, I use the Co-Pilot. If I need to bring a laptop, I opt for the slightly larger Pilot, which accommodates my 13″ MacBook Air with room to spare. These bags both have exceptional design, are built to last and look good too. You can also customize the colors and bag components to a certain extent, which only adds to their awesomeness. In addition to these two, Tom Bihn makes quite a few other bags, backpacks and accessories. I haven’t tried them all (yet), but I have no reason to doubt the quality is the same as the ones I already have. 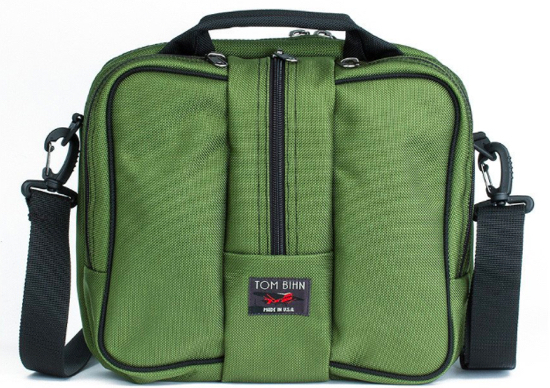 If you need a bag (or two), you can’t go wrong with Tom Bihn. These recommendations are by no means exhaustive. They are just to give you a starting point or some potentially new ideas if you’re already embracing the analog. One of the great things about life is experimentation. Try things out. See what you like and don’t like. Have some fun with it. I’m also not saying you should give up your digital tools completely. My analog and digital devices co-exist and work together to help me accomplish what I need to accomplish. I’ve found a good workflow that encompasses all my gear. Hopefully you will too. If you have any questions or comments, feel free to post them below or drop me an email. I’m happy to help. In the meantime, enjoy your new tools and get to work! This entry was posted in Analog, Cool Stuff, Geek, tools and tagged Analog, Analog Tools, Bags, Done Paper, Field Notes, Fountain Pens, General's Cedar Pointe, Kum, Lamy, Lamy Safari, Leica, Leica M6, Notebooks, Palomino Blackwing 602, Paper, Pencils, Pens, Pilot, Pilot Iroshizuku, Pilot Metropolitan, Rhodia, Tom Bihn, Uni-ball, Writing. Bookmark the permalink.